The collection of interviews presented in Stage Fright is a well-rounded accumulation of several years of interviews with various publicly known speakers. Ranging from politicians to a timeless poet to comedians, this collection is rich with insight from the people that have spoken publicly and professionally for decades. Mick Berry questions interviewees about when, why, and how they conquered their stage fright. 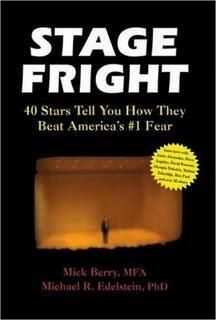 Each person reveals moments of stage fright, how they worked to get rid of it, and how it fed their performance. David Burns, who leads workshops to help people conquer stage fright, describes how some of his clients overcome their fear. His strategy is to simply put them on stage and point out how their fears are controlling them. Reading about what so many performers have gone through is what is ultimately valuable about this collection. Maya Angelou proved poetic in her interview, eloquently embracing her anxiety until this day despite some fifty years of bearing it all. I love Jason Alexander’s mantra of having strength, courage, conviction, and joy. He uses it as a personal reminder that because he is privileged to have the talents he has, it’s best to share them with the world. The ideas shared by the interviewees help to ease the tensions of having to perform in public. Putting the ideas into action, however, might be another issue entirely. As a musician who has not played a show in nearly two years, I found this book to be a much needed wake up call. Hardly anyone can perform perfectly from the beginning. Performers have to allow themselves to feed off the “butterflies” to become better. A running theme is the comforting fact that "the crowd is not out to get you." Either you will be liked and you will continue to perform or you will bomb—but life will go on either way.